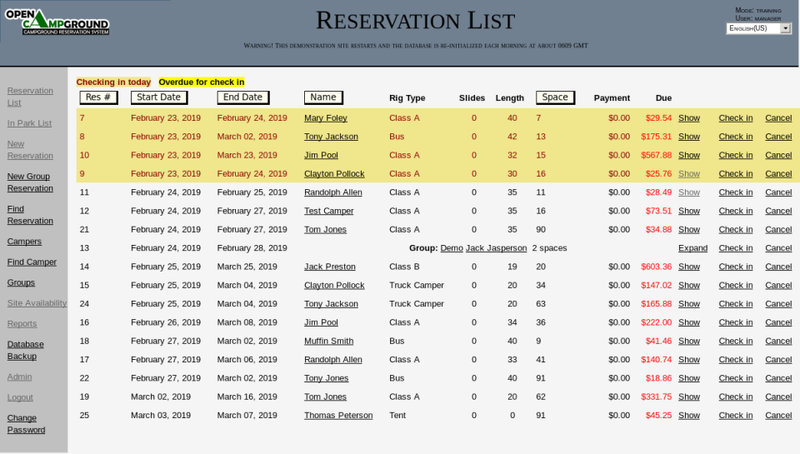 Owners/managers of campgrounds or RV resorts who would like to transition to a computerized reservation system. With the Cloud system remote reservations are easily supported. $15 per month in cloud for 50 sites. $25 for cd. 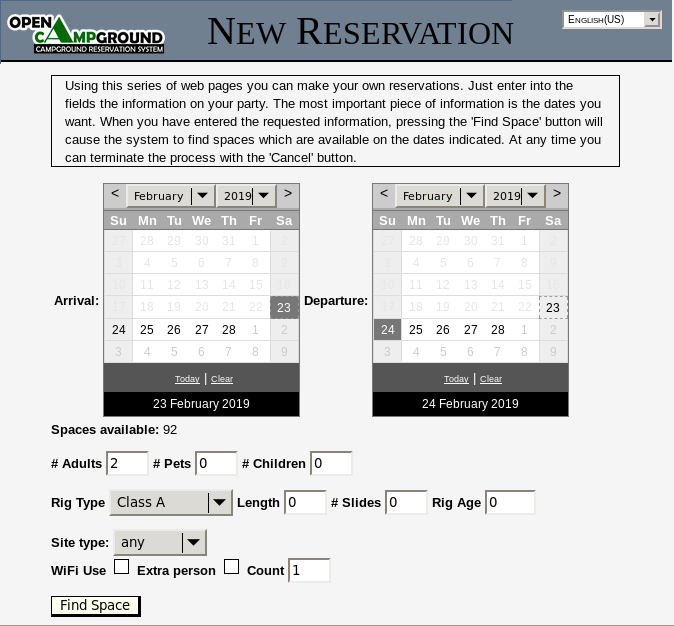 A simple to use campground reservation system either on your desktop or in the cloud. Inexpensive or even free. The system handles reservations and customer information and ensures sites are not double booked. You can run the system on your computer or have the system as a service (Open Campground in the Cloud). Supports 13 different locales. Cloud system costs thirty cents per site per month (minimum $15). CD for your own computer is $25. Demo on website. Open Campground Reviews Recently Reviewed! OPEN CAMPGROUND...is the Best for Small Campgrounds. 2. Ease of setting up rates, etc. 4. Quick responses from Norm when I have a question. 5. Love using CardConnect for my credit card processing. Cons: I have no cons regarding Open Campground, now after three years I've got it totally figured out and working for me efficiently. 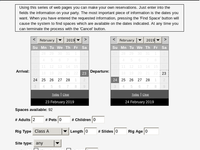 Overall: I never have double bookings any more with this system. Love being able to easily send update emails or reminder emails, which is handy when folks book a month or two or more in advance. 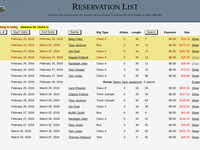 LOVE LOVE the group reservation. 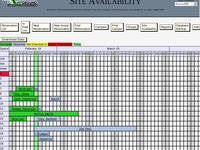 So handy since I have many groups a year reserving 10 or more sites. The fact the Norm is only as far away as my computer keyboard - he is so quick to answer/resolve any issues I am confronted with. He can fix anything. Comments: The main PRO for Open Campground is cost. From there it is ease of use. It does all of the basics you need for a small park. There are some CONS however. Some of the reports don't work like they should and managing measured add-ons is problematic. The one CON that makes the software almost unusable is the inability to extend a stay beyond a single day at a time. This is a major flaw. You are able to set up rates based on one day, one week or one month but the only increment the software allows is one day at a time. So if you have a camper that comes in for a week and then decides to stay three more days, as an example, you have to do it one day at a time. Worse yet, if you have a special rate for a weeks stay and the camper decides to stay another week the software will not allow you to extend the stay at that rate even day by day. So you have check the guest out and then do a whole new reservation for the additional week. This flaw also applies to monthly stays as well. So if you have a park full of guests that want to extend their stay beyond one day you are stuck doing hours of work checking out and checking back in guests! Other than that, it does what it does and for the price, well, it has its uses. 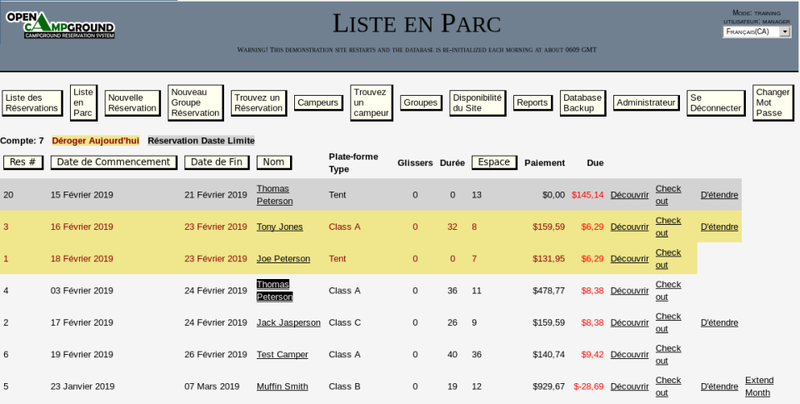 However, over time the hours required to do all of the extra work for stay extensions may justify spending the crazy prices for other campground software packages. The extend button is not the only way to extend a stay. 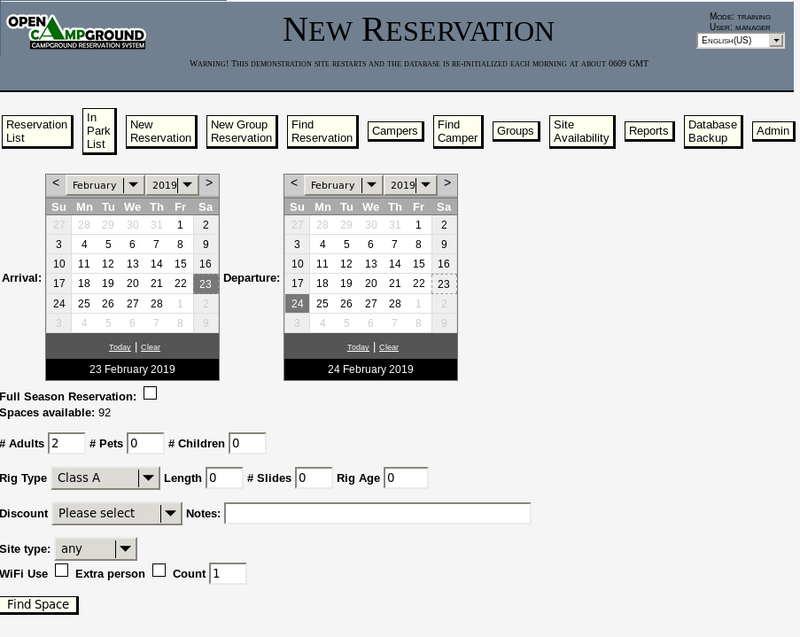 One can simply 'show' the reservation and change the dates of the stay. The extend button is only intended for a one or two day extension. 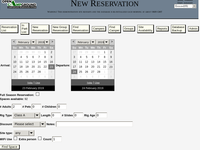 You do not have to do a new reservation to change the dates of the reservation. Comments: After having used costly software at a much larger campground, I was very happy to find Open Campground. Ours is only 80 sites, with about 1/2 seasonals, but we do have a variety of rates by site type, season and mid-week vs weekend, and the software allows for all of that. As with any program, there are times I need to over-ride a rate, but that is quick and easy. I have had a few minor issues along the way, but the best part is that ANY TROUBLE I have had has been resolved very quickly after emailing the designer. I get a rapid response, and it is corrected shortly thereafter. 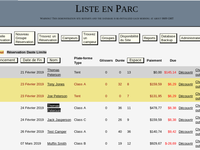 We have used the cloud based system, and just started taking the on-line reservations this year. Feel free to use the demo program to the full extent, so you can see what you are able to do. Would strongly recommend this program for other campgrounds. Great for our small campground. Comments: We have a small rv park, just 30 sites, so when I started researching software, I was shocked at how expensive they all were. Plus some charged per reservation. We simply couldn't afford it and it didn't make sense. Through research I came across open campground. It is inexpensive, works fine for our needs, and Norm is great at customer service. Sure, it's not perfect, but what software is and he keep improving it. I don't have experience with other reservations software but I'm sure they all have things you wish were a little different. For the price, I'll take this! Comments: We are a co-op mobile home/RV park with 100 homes and 38 RV sites. Managing the RV part was a disaster on paper waiting to happen. We started using camp hosts, which worked great to take off the extra load on our office person. Problem, was every camphost changed/modified our paper system. Going with Norm was fab. Solved our problems with having staff quoting correct prices, finding spaces, being able to describe sites etc. Norm has been great, making minor changes to his program to better fit our needs. Comments: Great program. Easy to learn. Great service! Quick response to questions. Cloud based. Access from anywhere to see whats happening even if we are away. Does everything we require. Easy to turn functions on and off depending on what you require. Prints a nice receipt for our guests with our logo and other information. Priced for smaller parks like ours. Developer always listening to the users and making improvements at no charge. We are a 50 site park and this is our third season using it. 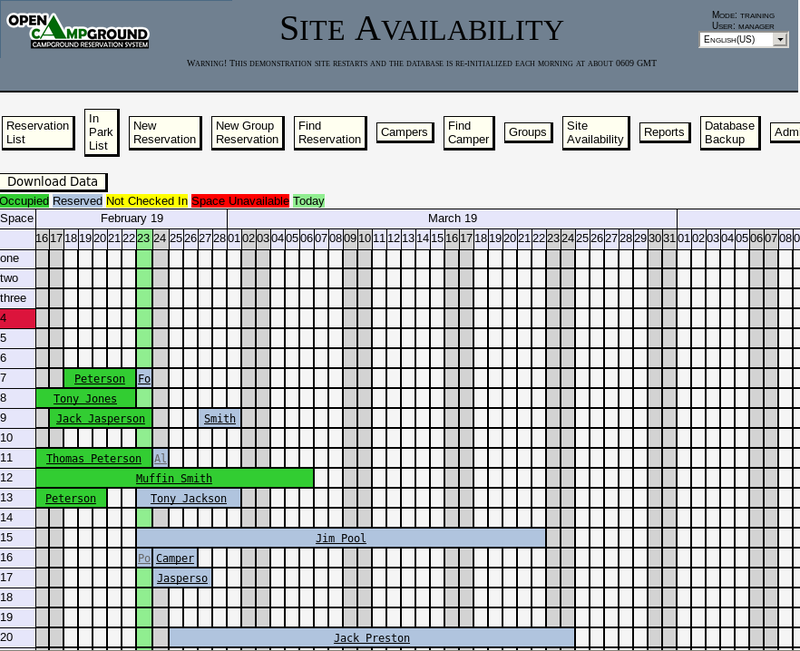 Comments: While I don't have experience with other campground software, Open Campground has worked very well for us. It has helped us increase sales and with their management of the server, has been absolutely hassle free. The ease of use and remote access on computer and phone has allowed us to have an online reservation system without high costs. Customer service is just an email away. My only issues have been of my own making. Comments: Able to fully customise to suit our tent campsite requirements, (we charge by the person not by the space). Norm always ready to solve any problem or make any changes we need. Have used this software for several years and could not run the business without it. Fantastic Value, Easy to Use, All the features you need. Great Help. Comments: We are a very small RV park only 28 spaces. This software is easy to use and fun to set-up. Has some limits but I am able to do workarounds. As the owner/operator I wear many hats including the IT portion. I can only praise this software for how it works and looks. Great Stuff!